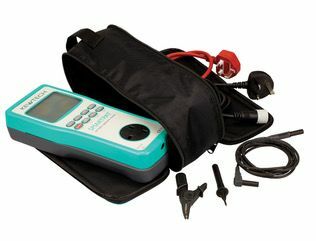 The SMARTPAT is a top-of-the-range, battery operated, manual PAT tester that will conduct a run leakage test at 230V and 110V. It can also be controlled via a smartphone or tablet running the KEWPAT App. 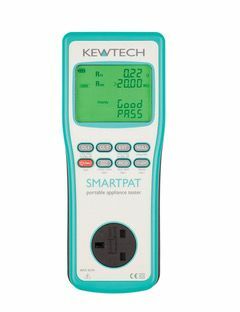 The SMARTPAT, together with the KEWPAT APP, covers all the functionality and more of a traditional downloading PAT tester. Data collection: Provides a very fast solution for logging your testing. Special drop down menus on the App ensures quick appliance documentation enabling you to add basic information such as appliance and location, or more detailed logging such as make, model, serial number and special comments as well. Testing: The App controls the tester so you can use the standard auto-tests or make up your own. The test results are automatically included in the appliance record. Risk assessment: All appliances need a risk assessment. The App has a risk assessment function that is designed to be optionally engaged during each test if required, leading to the desired frequency of re-test. 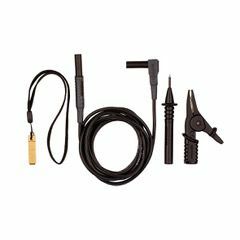 Cable resistance: Class I equipment has a variable pass limit dependent on the length of the mains lead. There is a simple cable calculator on the APP that can be easily engaged during testing. Extra functionality: The App makes full use of your mobile device by taking pictures, scanning barcodes / QR codes and giving you voice prompts.